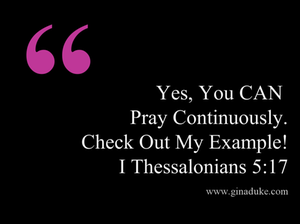 We often think that when I Thessalonians 5:17 says to “pray continuously” that we literally have to be completely relegated to prayer monk-style – cut off from the world and everything else that is going on. And because we think that is an impossible request, we feel as if we cannot live out this scripture, but that is simply not true. Praying continuously is living in an attitude of prayer. Watch my video to see how. I think you will be surprised to see how you already do something similar to this every day.